Most of New Zealand’s commercial fisheries appear to be in good shape, according to the Ministry for Primary Industries’ (MPI) latest sustainability round. Proposed TACC (Total Allowable Commercial Catch) changes include an increased catch for eleven species which are showing signs of increased abundance. 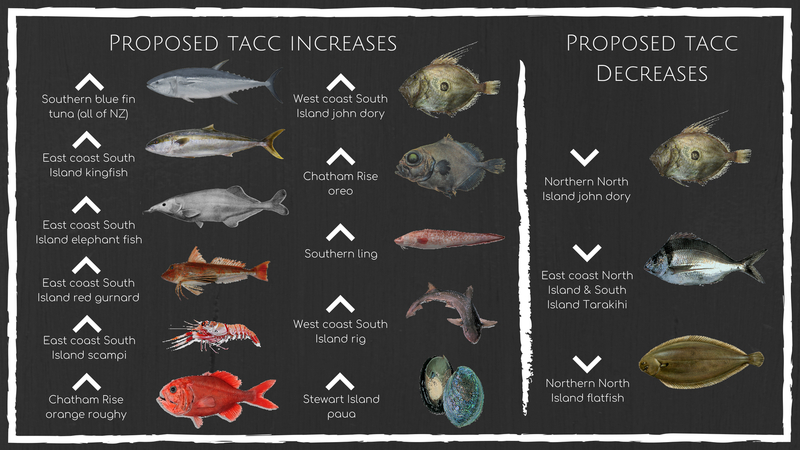 A closure is proposed for the Kaipara Harbour recreational scallop fishery and TACC decreases are proposed for the John Dory, tarakihi and flatfish fisheries. MPI, now Fisheries New Zealand, use scientific assessments to calculate the health of a fishery. Those assessments show that some 96.4 percent of fish of known status come from stocks where sustainability is not a concern. The assessments involve fisheries scientists from science institutes like NIWA, universities, industry, non-government organisations, and Fisheries New Zealand. Together, they have produced a significant amount of peer-reviewed scientific research which reveals healthy fish stocks in New Zealand's waters. Stewart Island paua (PAU 5B). East coast North Island and South Island tarakihi (TAR 1, 2, 3 & 7). Public consultation on these proposals closes 5pm Friday 27 July 2018. Deepwater Group and Fisheries Inshore New Zealand will be submitting feedback to Fisheries New Zealand on behalf of the quota owners that they represent. For full details on these proposals, download the consultation document from Fisheries New Zealand.